Because of some interesting timing of otherwise unrelated events, preferred stock investors are going to be treated to a large number of new preferred stock issues this year as well as a large number of calls of older issues. These somewhat unique circumstances open the door for preferred stock investors to cash an extra dividend check, receiving five dividends in a year, rather than the usual four. I'll show you an example in a minute, but all you'll need is a list of high quality preferred stocks sorted by market price such as the table presented here as Figure 1 (for the definition of "high quality" see the Special Announcement article below). Notice that all of the high quality preferred stock purchase candidates shown here are available for less than par ($25 per share). 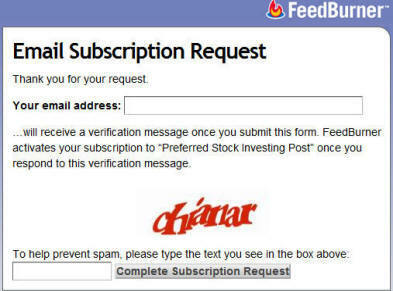 To protect the values of subscriptions to the CDx3 Notification Service (my preferred stock email alert and research newsletter service), the trading symbols and names of these preferred stocks are obscured here. But the February 2012 issue of the subscriber's newsletter, CDx3 Research Notes, provides this same table, with trading symbols, on page 6. And on the subscriber's exclusive website, the CDx3 Bargain Table HotList button generates the list with current pricing in real-time. Coincidental Timing "...At Least Until Late-2014"
The Global Credit Crisis plagued our financial system between early-2007 until well into 2009. Companies desperate for cash introduced high quality preferred stocks paying increasingly higher dividend rates all the way up to 9.6% in July 2009. Those preferred stocks all had five year call dates. That means that these crisis-era preferreds start becoming callable between 2012 (right now) and 2014. Now here's another data point: the Federal Reserve announced on January 25 that today's low-to-no interest rates are going to be with us "at least until late-2014." 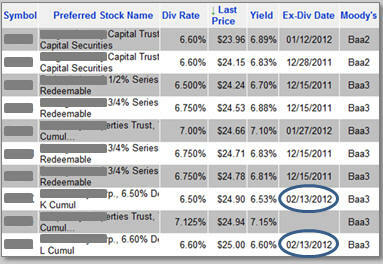 Note how that timing lines up perfectly with the call dates of the high dividend paying, crisis-era preferred stocks. All such preferred stocks are going to reach their respective call dates during a period of time, if the Fed has their way, of historically low interest rates. Here's what that coincidental timing means for us. Companies hate paying out more in dividends than they have to. Frequently, during periods of lower rates companies will issue a new preferred stock and use the proceeds to retire (call) their older, more expensive issues (they refinance). Since companies will generally be introducing new issues in order to generate the cash needed to call older issues, preferred stock investors are going to see large chunks of cash show up in their brokerage cash accounts (from the call) right when brand new preferred stock issues are being introduced. These circumstances create a "target rich environment" for preferred stock buyers. And the action has already started. There were seven new preferred stocks issued during January and, in all cases, some or all of the proceeds generated by these new issues are going toward retiring older preferreds. Because of the coincidental timing of (1) the Global Credit Crisis, (2) its duration, (3) the passage of five years and how that lines up with the call dates of crisis-era preferreds and (4) the unprecedented pre-announcement of future low-to-no interest rates by the Fed, preferred stock investors are going to be treated to a buffet of new preferred stock offerings at a moment when calls make you cash rich, starting right now. 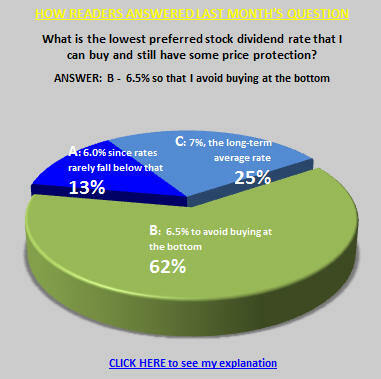 Because of the rules that govern the dividend payout of preferred stocks, you can claim an extra dividend payment. Normally, doing this is too much trouble for most buy-and-hold preferred stock investors. But as it turns out, earning five dividend payments during the same twelve month period is very easy to do during a time when there are lots of new issues and calls; as explained above, that means now. The best way to explain how this works is by example. Take the case of the Series L preferred stock from Public Storage (PSA-L). Owners of PSA-L shares have an opportunity during February to snag an extra dividend payment. Here's how. On January 4, 2012 Public Storage announced that it was going to be issuing a new preferred stock and using the proceeds to call PSA-L on February 9, 2012. That means that PSA-L shareholders are going to see a pile of cash show up in their cash account on February 9. The last payment from Public Storage on February 9 will include not just the liquidation price of $25 per share (par), but also a dividend payment for the last (partial) quarter of this security's life to February 9. 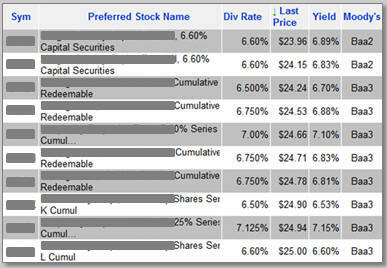 So those holding PSA-L shares will be paid dividend income that includes the first five weeks or so of 2012. 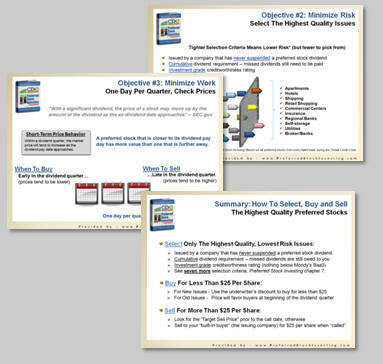 Now look back at the list of high quality preferred stocks in Figure 1. Notice how two of these purchase candidates are not only available for a market price below par ($25), but also have February 13, 2012 ex-dividend dates. Holders of PSA-L are going to see a pile of cash show up in their cash account on February 9, just in time to purchase shares of one of these two issues that have February 13 ex-dividend dates. Preferred stock dividends are paid to whomever owns the shares at the start of trading on the morning of the ex-dividend date. And such shareholders receive the entire quarter's dividend payment (90 days worth regardless of how long you have owned the shares). So those who use the cash from the February 9 call of PSA-L to buy shares of one of these other two high quality preferreds before February 13 will be paid twice for the same period. The unique timing of the otherwise unrelated events described above has created a preferred stock marketplace that should provide a bumper crop of new preferred stock issues over the next three years, the proceeds from which will be used to retire older shares in many cases. Once a call is announced for your shares, a list of high quality preferred stocks available for less than par can be used to help you make a more informed decision regarding your next purchase. Frequently, using such a simple technique will allow you to get paid twice for the same period of time - a fifth dividend. (Already a subscriber? 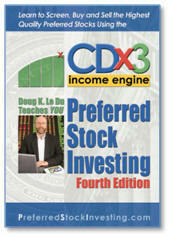 For symbols see the monthly CDx3 Bargain Table on page 6 of the current issue of CDx3 Research Notes). There are about 1,000 preferred stocks trading on U.S. stock exchanges. Of these, there are 10 specific issues that are of particular interest this month. Not only are these the highest quality preferred stocks available but they are providing an average annual dividend yield of 6.83% right now. If that isn't enough, what makes these particular preferred stocks stand out this month is that they are selling for a market price that is below their $25 "par value." Buying your shares for less than par adds a layer of principal protection to your investment. As explained in the "Last Month's CDx3 Investor Results" article above, the marketplace for high quality preferred stocks is likely to see a high number of calls throughout 2012. When your shares are called by the issuing company, preferred stock investors are often looking for that next purchase in order to keep their cash working for them. In the event that the issuing company retires (calls) the shares, shareholders will receive the par value ($25 per share) in cash from the company. By purchasing your shares for less than the par value ($25), you position yourself for a nice capital gain to pile on top of the great dividends that these high quality preferreds pay you in the meantime. Already a subscriber? The trading symbols of these 10 high quality preferred stocks are listed on page 6 of the February 2012 issue of the subscriber's newsletter, CDx3 Research Notes. For example, for preferred stocks from telecommunications or manufacturing to become candidates, you would have to give up the "cumulative" dividend requirement. While there are a few exceptions, preferred stocks issued by companies in these industries are generally "non-cumulative," meaning that if the issuing company misses a dividend payment to you they have no obligation to make it up in the future. Risk averse preferred stock investors are looking for preferred stocks that are "cumulative." In fact, it is the "cumulative" dividend requirement that saved CDx3 Investors during the Global Credit Crisis more than any other criteria. Looking at the 70 bank-issued preferreds that were trading at the time, the 13 preferreds issued by the banks that were saved from bankruptcy were all "cumulative" (see itemization). Having cumulative dividends, an investment grade rating and being issued by a company with a perfect track record of never having suspended preferred stock dividends are just three of the ten CDx3 Selection Criteria from chapter 7 of Preferred Stock Investing. With new issues being introduce, and old issues being retired, the number of preferred stocks trading every day ranges between 1,000 and 2,000. By applying the ten CDx3 Selection Criteria, preferred stock investors are left with the highest quality issues available. 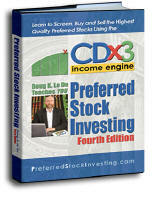 The resulting list is available 24/7 to those subscribing to the CDx3 Notification Service.